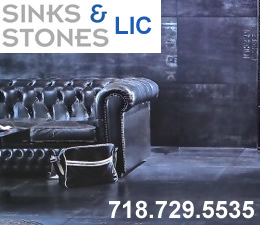 Updated Spring 2014 / March 7, 2012 / Long Island City / Manhattan Real Estate / Queens Buzz. I just returned from a breakfast where the NYC Deputy Mayor of Economic Development presented the NYC plan to develop an eleven acre campus on the southern end of Roosevelt Island, into an applied sciences academic institution. Development of the new facility will take place over the course of the next thirty years, but the first classroom will open [somewhere in a leased facility] in the fall of 2012. When the applied sciences campus is done, the facility is expected to include about 2 million square feet of new construction and a half million feet of open space. Over the course of the next few decades, the institution is expected to become the academic home to 280 faculty members, a student body of 2,500, and to provide ongoing employment for about 8,000 people. Click here to read the rest of our report on the presentation given by Robert K. Steel at the LIC Partnership breakfast about the new applied sciences development on Roosevelt Island, which legally is considered Midtown Manhattan real estate. Continued. 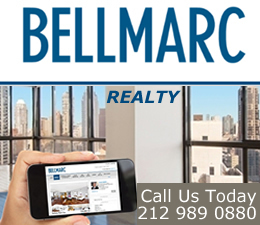 Updated Spring 2014 / March 7, 2012 / Long Island City / Manhattan Real Estate / Queens Buzz. I walked into a standing-room-only conference room of about 100 attendees. 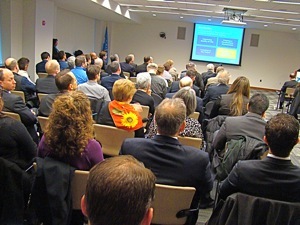 The LIC Partnership breakfast presentation was given in the conference room shown in the photo to your left. Gary Kesner, the LIC Partnership Chair, introduced Robert K. Steel, the NYC Deputy Mayor of Economic Development. Over the course of the next hour, Mr. Steel presented the NYC plans to develop an applied sciences campus on Roosevelt Island and fielded a number of questions from the audience. Mr. Steel began his presentation by talking about NYC’s position in the applied sciences field sector of the information economy. He noted that curently the city is behind a number of other regions, even though NYC has a competitive post secondary educational system. 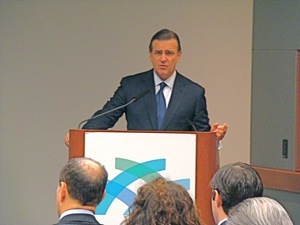 He briefly discussed some of the leading regions in applied sciences including: 1) California’s west coast triumvirate of [Silicon Valley] San Jose, San Francisco and San Diego; 2) the technology corridor along Route 128 near Boston, Massachusetts; and 3) the Dallas / Austin / Houston / San Antonio quadrangle. These regions are leading America in the development of future technologies in the computer, healthcare and engineering fields. 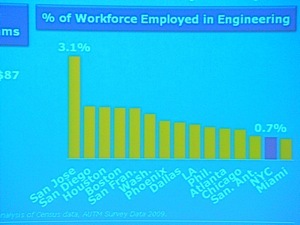 He showed us the slide you see to your left, which outlines the percentage of employment in the engineering fields. On one of the slides he showed the investment per capita in the top one hundred research and development programs. Boston ranked the highest with $87 in per capita spending for the top engineering programs, while NYC was shown to receive $7 per capita. As the applied sciences greatly contribute to productivity and high paying jobs, the Mayor decided in 2010 to field a proposal to see what interest there might be in the development of a core applied sciences program / facility in NYC. 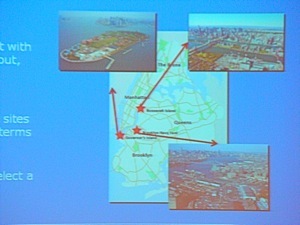 To entice potential institutions to come to NYC to develop an applied sciences program and facility, the city offered: 1) $100 million in funding, 2) acres of real estate for free at one of three designated locations [Brooklyn and Staten Island were also potential sites – see photo below to your left], and 3) assistance in navigating through government regulations in the development of the program and facility. Within months twenty-seven institutions expressed an interest in becoming one of the core stakeholders. 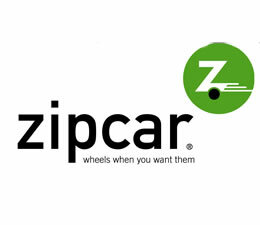 Seventeen of them responded and seven of them made bids based upon the RFP [request for proposal]. In December of 2011, two of them, Cornell University of Ithaca, NY and Technion, the Israel Institute of Technology, were chosen to develop the applied sciences program and facility. 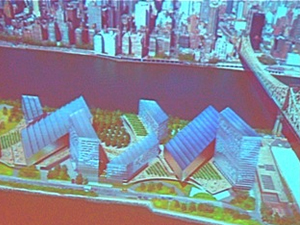 And Roosevelt Island was selected as the location for the applied sciences campus. Mr. Steel outlined the timeline, informing us that the first classes will begin in fall 2012 in a leased facility. Meanwhile, the two acadmic collaborators and the city are working to find an architect to design the campus. Mr. Steel noted that the artist’s rendition of the site you can see at the story introduction, is only a conceptual drawing. The real / ultimate design is yet to come. 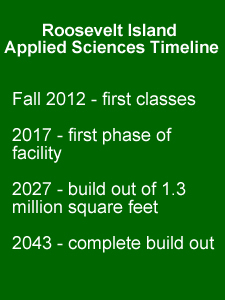 Mr. Steel presented a diagram showing what developments the applied sciences programs would target. There were three circles that encompassed 1) Connective Media, 2) Healthier Life and 3) Built Environment. 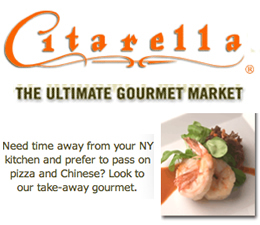 The first, Connective Media, includes advertising, entertainment, finance, publishing and retail. The second, Healthier Life, includes healthcare, insurance devices and medical information systems. And the third, Built Environment, includes architectural design, construction, energy and transportation. 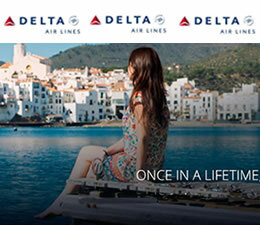 The timeline included starting the first class in the fall of 2012 at a leased space. The next target comes five years later, with the opening of the first facility on Roosevelt Island in 2017. In 2027 the facility will grow to 1.3 million square feet and by 2043 the facility will be completed. Mr. Steel also digitally introduced us to some of the key players in the applied sciences campus project. 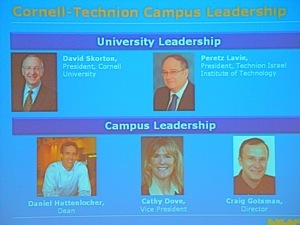 They include Daniel Huttenlocker who will be Dean, Cathy Dove Vice President of Cornell University and Craig Gotsman Director of Technion Israel Institute of Technology. 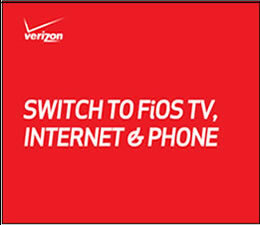 They are shown on the lower half of the slide to your right. The program has several other components to it including a commitment on the part of the collaborating academic organizations to partner with public schools to enhance math and science programs for at least 10,000 students and 250 teachers per year. 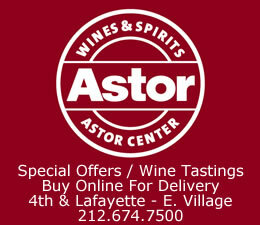 And the creation of a $150 million fund to help NYC start-ups. Mr. Steel said that job creation is one of the motivating factors in this initiative. 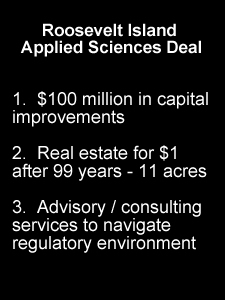 The city expects the applied science campus to spawn 600 new businesses and to generate 30,000 new jobs over the next 30 years. They also expect construction of the new site to create 20,000 temporary construction jobs, over the course of the three decades. 1. Only one applied technology effort? In the question and answer session, someone asked whether the city would work with other institutions, like Columbia and NYU, to nurture the development of applied sciences in the city. Mr. Steel said they were in discussions with a few of the other bidders, but that the city would not be making any other comparable offers in terms of cash and real estate. 2. Impact of RIOC having control of some land included in deal? Another audience member noted that some of the land included in the deal for the new campus is controlled in part by the Roosevelt Island Operating Corporation [RIOC]. The RIOC controls some of the land involved in the deal and access to the Roosevelt Island infrastructure also requires RIOC approval. Mr. Steel indicated that these issues were being managed. 3. Waterway access to Roosevelt Island? Another audience member asked what plans, if any, were in place to provide waterway access to the island. Mr. Steel said thatin the summer of 2011 the city funded a three year trial program to provide water ferry service along the East River waterfront. He noted that it was exceeding its goals, due in part tothe unseasonably warm weather. If the trend continues, waterfront access might be expanded. Roosevelt Island water way access would likely be on the east side of the island as he noted that it was the “only dockable place”, and he noted, it is also a fairly narrow waterway. 4. Transparency and access to bidding for projects in the build and management of the facilities? The last question inquired as to how transparent the bidding for projects associated with the development would be to the public. Mr. Steel responded that he thought it would be. All in all it was another informative breakfast sponsored by the LIC Partnership at the MetLife Building in Long Island City. 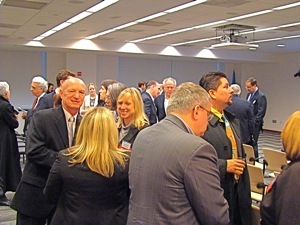 In the photo above, Gary Kesner, LIC Partnership Chair, is shown on the left, talking to attendees after the presentation.